Manjira made from iron sheet. we done brass polesh on it. Available in 2.5" to 6" diameter. We are ranked amongst the most trusted firms deeply engaged in offering a wide range of Brass Manjira. We offer you a vast range of manjira musical instrument in brass and iron. With our consistent focus on globally hit trend, we proudly introduce a wide assortment of Classical Manjira. Our offered products are widely acclaimed for their indispensable features. These products are designed using high grade basic material and contemporary technology keeping pace with current market standards. Owing to our years of industry experience and precise knowledge of this domain, we are offering an outstanding assortment of Manjeera Instrument. 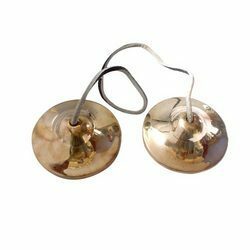 Manjira are basically hand cymbals which are struck together to produce sound. We are one of the prominent manufacturers of this musical instrument which is widely used during the festivities like bhajans and keertans in the Indian Culture. Made of brass, these manijiras are mainly used in temples. Manjiras have different local names such as jhanj, mondira, kafi, tala and others. A magnificent gamut of Manjiras is being offered by us at highly affordable prices. 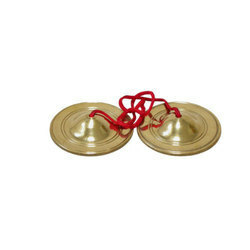 These medium sized manjiras are made in brass and well checked for sound features. Manjiras are usually played in folk forms as well as devotional music like bhajans and kirtans in temples throughout India. We are among the reputed organizations, deeply engaged in offering an optimum quality range of Musical Manjira. Enriched by our vast industrial experience in this business, we are involved in offering an enormous quality range of Brass Manjira. We are one of the most well-distinguished companies in the market that are into offering Traditional Brass Manjeera.